I was looking at the Gold chart and the one thing I have noticed since the 'bottom' on Thursday 16th August 2018 is that Gold has been making 'higher lows' and to a certain degree 'higher highs' though the lower lows have been more stronger than the higher highs. Now a potential Gold trade could be that when the next higher low is formed to open a long trade with a stop loss around the $1200 area to ensure volatility does not stop you out unnecessarily. I think a price to go long around the $1220 - $1225 area could be achievable and also an attractive entry point. I see Gold trying to attempt the $1243.00 area which would bring it nicely towards the 200 day moving average price. This is something that I myself will be considering as Gold is currently trading above its 20, 50 and 100 day moving averages. This is my indicator/signal to start getting interested. I am never convinced with the potential points / profits on offer with Gold and I do not at this point envisage a big move in Gold which is the reason why I have not yet pulled the trigger on such a trade. For me to personally be interested in this trade I would need to apply some serious leverage to maximise the profit potential as I just do not see a big move yet in Gold. It could happen in the months or years to come but right now I am not sure. I could be wrong and Brexit could start a domino effect but I do think Gold has the potential based on the current price action to certainly go for the $1243 area which could be a nice short term trade. I have included a diagram below where I have highlighted the 'lower lows' and slightly weaker 'higher highs' below. The circle at the end is where I am envisaging the price to hit at some point in December / January should this trend continue. I think there is a potential short term 'Long' trade here in Gold and though I am not a fan of Gold based on point / profit potential, I think I could get interested when applying leverage to maximise any profits in such a trade. Gold has just made another 'higher' high. One could open a long trade based on this or wait until the next higher low is formed. From a risk management perspective, Gold seems unlikely to just simply drop at this stage due to economic and political uncertainty around the world and of course any potential unwinding of Central Bank policy that we have been witnessing and experiencing over the last decade. It seems that Gold may have bottomed. The question for me is that do I enter now or do I wait for that 'higher low' which may end up being higher than the current price? What is really crucial for me is that the price Gold hit today was the same as the bottom on around Tuesday 12th December 2017 which was the last major drop before the more recent downward drop in Gold. It seems to be surpassing this which in itself is positive. 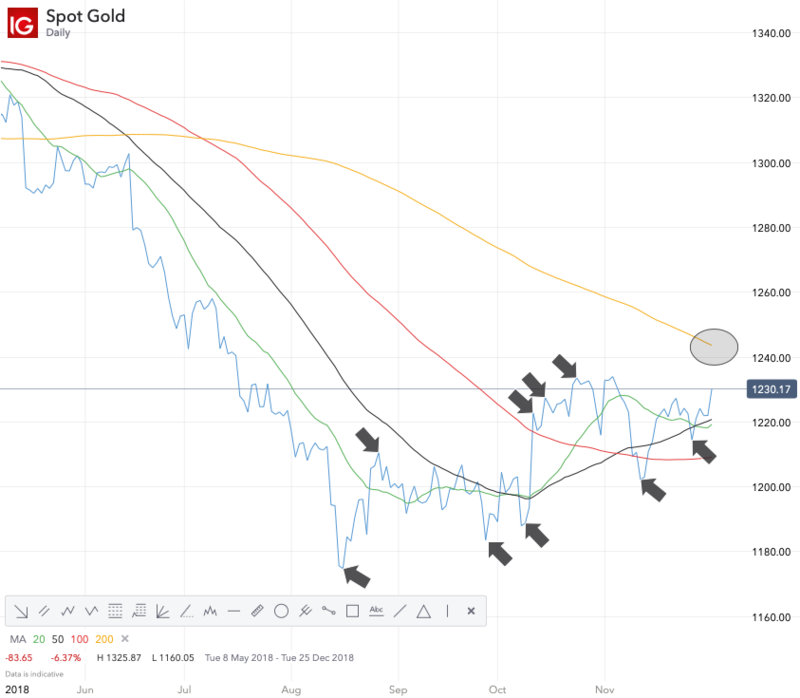 I think what I am thinking of doing to maximise any play on Gold is to wait for the next higher low and open a small long position and then increase my position on every higher low going forwards or as close as possible as I will never get in right at the bottom as I do not have a 'crystal ball' but as close as will do. I am trying to keep my analysis simple for the purpose of those on IG Community to follow. The 50 day moving average has crossed the 100 day moving average and the 20 day moving average has crossed the 50 day moving average making the current price action in Gold positive with an upward bias. Hi @TrendFollower, tis an interesting chart, the current state of play is that doubt on the initial Trump tweet that tariff compromise has been reached with China as China has made no move to confirm and tomorrow is a US closed market re: ex prez Bush funeral. Never buy directly into resistance but rather wait to see how price deals with it. @Caseynotes, yes an interesting point. Based on having odds in your favour, it would be better in relation to probability that when the price reverses after hitting or approaching resistance, be more likely to give a more successful outcome on the trade. The price could go below resistance which can happen of course. Very good point indeed. In terms of US closed market, my understanding is that the Commodities market will continue as normal so the Gold price will be very interesting. It has already dropped down to $1234.06 overnight from $1240.22. I have just read that Trump may re-consider tariffs with China if both countries cannot agree on a deal. I would like to see how the Gold price reacts to this news. Agree @TrendFollower, it all hinges on how China are going to play this, Trump thought he had some kind of a compromise with China at the G20 but China is staying tight lipped throwing all in doubt. It is Chinese producers who are being hit the hardest to the benefit of other Asian countries. The impact on US consumers has been described as 'minimal' so it's wait and see atm. Looking at the price action as of 6:30 pm (now) it seems Gold may try and make a higher low. 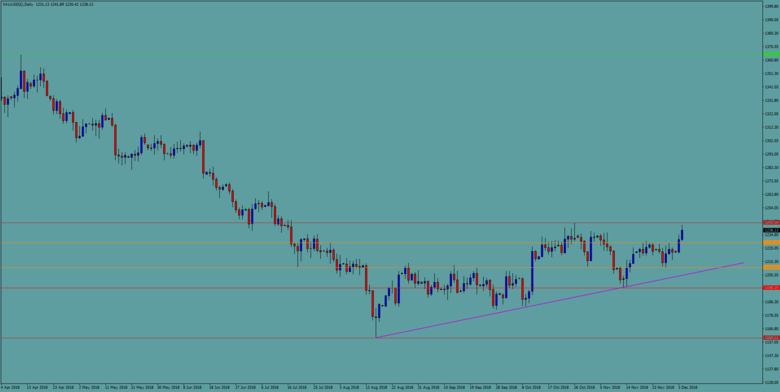 If it does then I will have to consider opening a small long trade and then add to it on every higher low. There seems to be a pattern forming which going forwards will hopefully confirm my assumptive/predictive analysis. I have been checking this out since your very first post and I do agree with what you say about point/profit potential. 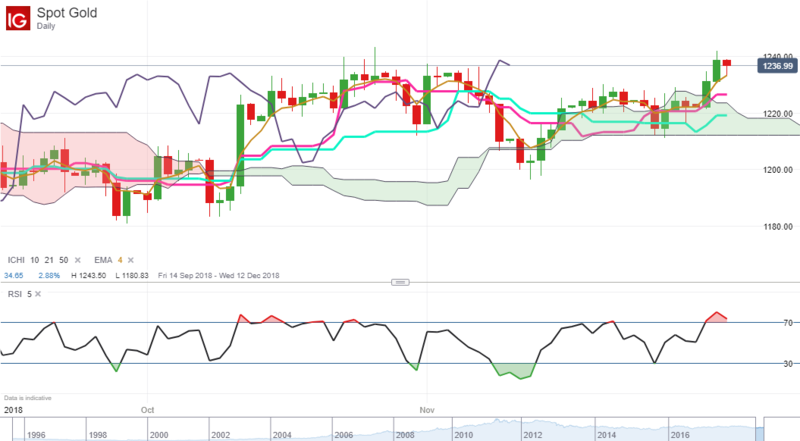 I have been getting on quite well with the Ichimoku indicator and the hourly chart shows the price has moved down into the cloud (yikes!) The 4hr shows price well above the cloud but recent price action has brought it down to a the trend line on the lagging line and below the faster MA although it's not really a MA but in any case it makes me wary of going long. The daily shows the RSI 5 still in the red at about 71 so only just but its not enough for me to go long, even just a a little. Even as I am typing, the 4hr needs a big up to get back on to the lagging trend line as its fallen off after the 8pm closing candle. I do not think the trend is as strong as I would like so it is certainly 'food for thought'. My worry about opening a long trade on Gold is that it is followed by months of sideways action and I have capital tied in to a trade which I am not profiting from as much as what I could have on another trade (Opportunity Cost). This capital could be used on a Natural Gas short trade or another commodity trade. Price and momentum have got out of sync on that recent fail to the monthly chart highs (dark red horizontal) with both divergence (solid white) and hidden divergence (dotted) fail, needs to regroup down at recent support before mounting a more substantial challenge. I totally agree with your comments on the sideways action that ties up funds @TrendFollower. I think you’ve convinced you and me to leave this one alone, well for now at least . Yes, the momentum is possibly not strong enough for me at this stage but I shall still be following Gold as I want to see how effective Mercury's analysis and charts are. Predictive Analysis can be extremely complex based on what seem very simple theories. Mercury has posted fairly long posts on his own analysis on Gold and Silver which I have been following. Now I want to test his analysis by monitoring Gold's price action to see what happens and how effective it is. I am at the monitoring price action stage. If the volume, strength of the trend and momentum pick up as well as the price action then these combined indicators may possible push me towards opening a long trade. I am not too worried about getting in at the bottom as using a 'trend following' approach I never will. I want to catch the big chunk in the middle. I will never exit right at the top either. I will wait for a clear trend reversal which will then execute either my trailing stop or stop loss. In my mind I still do not think there will be enough points on offer on any Gold trade to really get me excited but I am keeping an open mind with Brexit, economic uncertainty around the world, Trump / US plus any political situations that may arise. At $1240 level Gold has made a new higher high. It seems that it may continue with another move higher, especially with major equity indices performing the way they are. I mean the FTSE 100 price action was remarkable. It seems it is reacting to Brexit in anticipation. I was going to wait for the new higher low before placing deciding whether to plan an entry but this is where the unpredictability can come into trying to predict future patterns using historical price patterns. Interesting attempt on the resistance level on the US open yesterday, wondering how much was down to buying pressure and how much was down to lack of selling pressure until arrival at the level. No doubting now where they are all waiting anyway. If buyers are able to clear out that level should see a surge higher. For me what I would like to understand is where the capital leaving equities is going to? Is it Bonds? I am not so sure at this moment in time. The majority of that capital is certainly not going into Gold or even Bitcoin. It may be just pure Cash but if the world economies do begin to slow down or there is an equity crash then bonds could become very interesting. In terms of Gold I am expecting a slight drop and then a new higher low to be formed. I am intrigued to see if this does actually play out this way. I am predicting it will hit $1250 - $1251 and then we may see that drop. Commodity Markets like round numbers and targets from my experience. I then see Gold making a new higher low at around the $1225 - $1230 level. If this happens then I am more likely to open my long trade in Gold which I have been considering and sharing this trading idea with the IG Community. Gold has also gone above its 200 day moving average which is also a very bullish sign. Volume looks steady but nothing spectacular. This means the big capital has not shifted to Gold yet. This move is impressive without big volume so one can only imagine what the move could translate to on much larger volume. The momentum indicator is looking stronger. The trend in Gold right now is upwards. I have stated many times in the past that I am not a fan of Gold but I try to keep an open mind and try to trade based on price action rather than my own personal opinions and beliefs. The price action is telling me to open a long trade on Gold. What I am doing is sharing my thought process with the IG Community by trying to explain how I may be looking to enter this trade. I am waiting for the next higher low to be formed which I think will be around the $1225-$1230 level and I will look to initiate a long position within this level. I am not too worried if it is at the higher end of this level as it will still be lower than the current price in what is an uptrend in Gold. I will then look to add to my position on every new higher low that is formed and 'pyramid' upwards and with the use of leverage look to maximise the profits I can make from such a trade. As I have mentioned many times I am not a fan of Gold but I believe there are a few times within a generation where there is a optimum time to trade Gold and the most recent one was its move towards $2000.00. I believe this is another time around a decade later. They do not come that often but I think we could be heading towards one. From a risk management perspective one does not want to be unnecessarily stopped out due to volatility and we know Gold is making new higher lows so any stop loss needs to be carefully considered but there must be a stop loss. This trade could still go against me and there could still be a vicious trend reversal but I think with Gold, as it is far less volatile than other commodities, one could be more generous on their stop loss. Once in profit then a trailing stop should be implemented. I now want to see if the price behaviour supports my prediction based on historical patterns and trends since 16th August 2018. Also upwards trends can last a very long time so this could be a trade that is held many months if not more and therefore it is a long term trade so one needs to make sure it makes the best decision possible at the time. I tend to use 'Spread Betting' as all profits are free from tax and the ability to use leverage. However there will be daily charges which is why one must not trade against the trend and why I am trying to make my entry point as effective as possible to ensure charges do not count against me in such a trade as these will be daily charges and if the position is held for many months then I am sure one can appreciate how such charges can add up! Gold hit $1251.42 and is now trading at time of writing $1248 so it will be interesting to see if this goes down towards my target now? 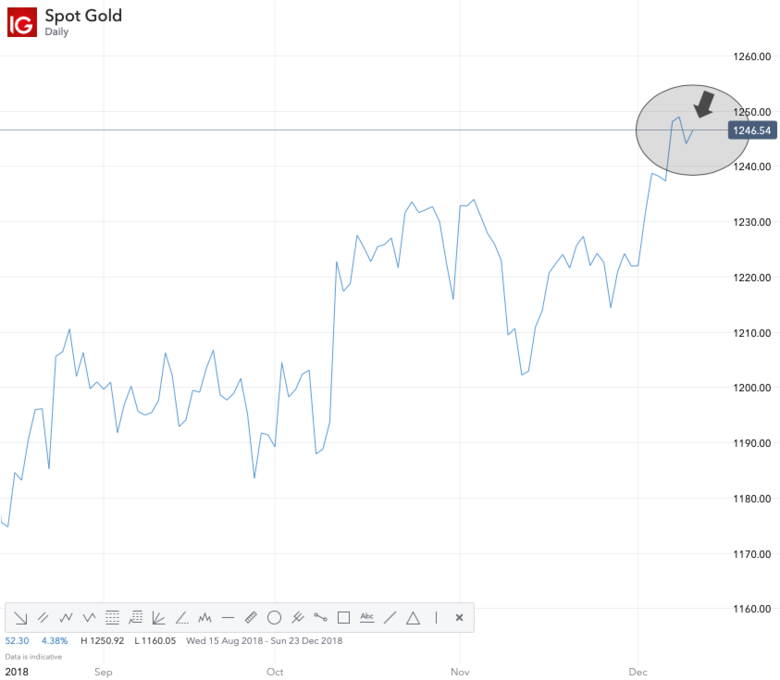 It seems Gold has made a new higher high. This repeated pattern can be used to conduct any predictive analysis which is merely assumptive based on historical price action. It does not necessarily mean that future price action will perform the same way. As I have stated in a previous post in this thread that I think a new higher low will be made around the $1225 - $1230 level. If this happens then I will be initiating a long position and then add to my position as the price increases near around the next higher low level. There is risk in this particular strategy as if the next higher low is the beginning of a trend reversal then it could eat into any profits so one must monitor price action on a regular basis and basically live and breath the price acton of Gold whilst in the trade. In terms of price target I do not have one and nor can I even predict one for Gold. I am just letting price action tell me the 'story'. I personally think that if Gold can stay above $1250.00 then it will try and go for $1300.00 as Commodities love round 'psychological' numbers and the Hedge Funds, Speculators and Trend Followers will ensure it gets there. So my price target would be $1300.00 in the first quarter of 2019 or at least by the start of the second quarter of 2019. Please do not take this target with any certainty as I am merely answering your question. I do not know what will happen going forward and I do not have a 'crystal ball' but upward trends tend to last a lot longer than one thinks. The aim is to stay in any long term trend as long as possible and only exit when there is a clear trend reversal. In this instance the trailing stop should execute a nice profitable exit. The problem I have this morning is that Gold could continue going upwards and my prediction of a higher low around the $1225 - $1230 level does not materialise or it does indeed correct. Now if the latter happens then I know exactly what I am going to do. However, if latter does not happen then what do I do? 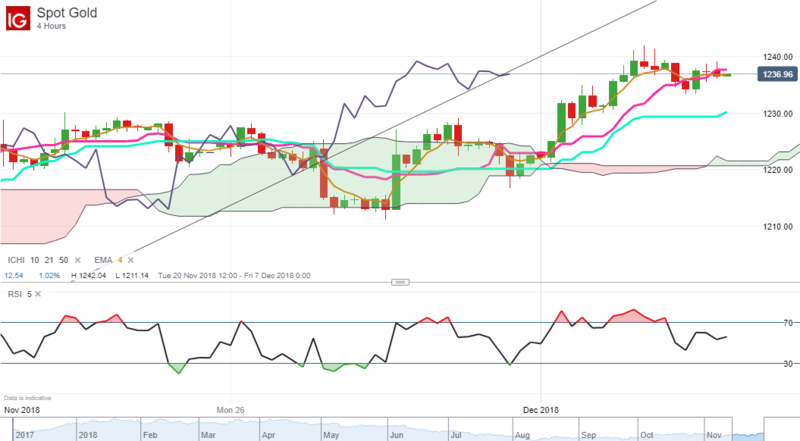 Buying with the strength of the move means that you are buying with the trend in this case. I will keep a close eye and may have to adapt my strategy depending on the price action going forwards. I may not be fortunate enough to get back in at $1225.00 to $1230.00 levels in which I case I need a clear strategy and plan in terms of how I enter this potential Gold trade. For me if Gold was to revisit $1250.00 then I would buy into this strength and initiate a long position. The 1243 was the resistance level to beat since mid October and having finally got through looked to retest that level yesterday and looks to be using that level for support today. I have just opened a 'long' position on Gold at $1248.96 and a 'long' position on Silver at $14.68. These are initial small positions and both are via 'Spread Betting'. I will then add to my positions as the price increases and if the trend reverses or the trades go against me then I will be out, attempting to minimise my losses. I am sharing these two live trades with the IG Community as I think to really increase the value of this IG Community this is needed and necessary. If I exit these positions then I will try and explain why I exited the positions. If I add to my positions then I will try and explain my rationale behind such decisions. Thank you very much for your kind words but I hope I do not need any luck on these trades. I try not to rely on 'luck' or 'hope'. I know that is not what you meant and are just offering your kind support but there are traders that do rely heavily on luck and hope. These are 'poison' words for traders. I believe in trading with the trend as much as possible and trying to trade in a manner where the odds and probability are in your favour. This includes fundamentals lining up with the technicals to create that trading environment in Commodities that I tend to look for. I do wonder if I had waited as Gold and Silver have both dropped slightly since I opened my trade earlier today but if one thinks like that then it becomes very difficult to enter positions. One merely ends up sharing charts and conducting detailed analysis and finds a reason not to trade rather than actually trade. As a trend follower, I want to catch the big chunk of the trend in the middle. If I can achieve this then I will be happy. As to how long these trades will be then who knows? I am in until the trend changes and this could be a few days, few weeks or even a few months. I am expecting Silver to really rally towards the $15.00 level to catch up with Gold's chart. Silver is known to be like Gold but on 'Steroids' during a precious metal bull run. Silver tends to amplify any price action in Gold both on the long and short side. This is one of the reasons why I opened long positions on both Gold and Silver rather than use increased leverage on just one of them. I do see them both moving in tandem for the time being as I have not seen anything to suggest otherwise at this point in time. I have shared some very basic technical analysis with you all but I wanted to just discuss some of my fundamental analysis but using 'simple' and 'basic' English as I appreciate that there will be a lot of new traders who have very little experience to people from different countries whose first language may not necessarily be English. It is widely reported that the price action of Gold will be influenced by the US Dollar. If the US Dollar weakens then it will be positive for both Gold and Silver. The US Federal Reserves Monetary Policy will also be a key driver. Its interest rate policy will play an important part. I find it interesting to see what Hedge Funds are doing. I appreciate they get a lot of bad publicity but they hire some of the smartest traders. They do make mistakes and get things wrong but on Gold and Silver they tend to be pretty savvy. It was reported that Hedge Funds and money managers trimmed their net short positions in Gold and Silver contracts last week according to the US Commodity Futures Trading Commission (CFTC). This could explain a part of the reason for the recent price action in Gold as shorts are closed. The volume has not been enormous but when long positions increase the volume could follow. So 24 hours on and how are my trades doing? Well I am around 4 points down in Gold which is nothing so not overly concerned there. It is my Silver trade which has really excelled. I am around 6 points up. Silver actually hit $14.80 and it seems like the Hedge Funds, Speculators and Trend Followers will take it up to $15.00. So overall (just Gold and Silver trades) I am up and in profit. The profit on my Silver trade is far greater than the small loss on my Gold trade. This could still change and the trade can still go against me at any point as the chart is not conclusive to supports an odds on upward trend but the indicators are supporting my view hence why I am in the trade. So after 24 hours I am content. I am currently 10 points down on Gold and 15 points down on Silver. I am not too heavily concerned at this moment as if you look at my earlier posts then I was predicting a price move down on Gold to $1225 - $1230 levels and it is currently $1238 levels. So in hindsight I may have entered the Gold trade a bit too early and maybe should have listed to my instincts and waited. I think Gold will continue downwards towards the $1230 level before any next move upwards begins. I just need to be patient. Should Gold move downwards towards the $1214.00 level then I would be looking to exit. I am not looking to day trade Gold or even a short term trade either. 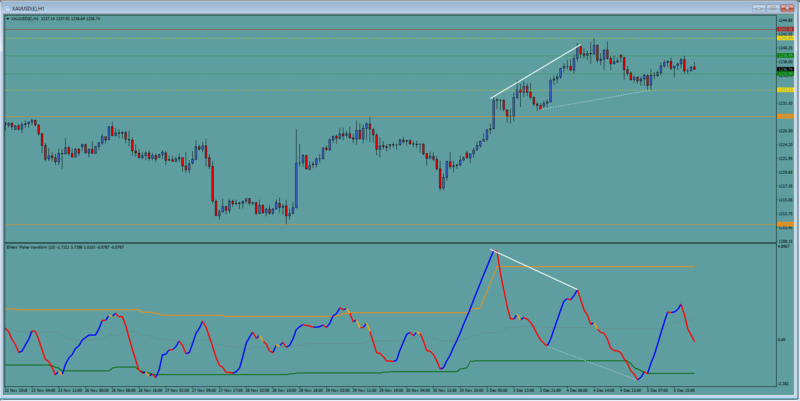 I am looking to trade the longer trend which I think may materialise in Gold and Silver. The question is will the overnight charges eat into my capital whilst the trade moves against me? Absolutely yes. This makes me question the suitability of this trade and there is absolutely no shame in admitting when one may be wrong. I am not suggesting that this trade is wrong as I will let the price action answer such a question. With long term trades using Spread Betting you simply have to trade with the stronger trends. I am questioning myself as I did well on Orange Juice and Lumber trades but they were strong trends. I am not so sure that Gold and Silver are demonstrating similar levels of strength in the trend like those other Commodities. My trades in Gold and Silver are hanging in there. From being 10 points down in Gold, I am now only 3 points down in Gold so a very good session today. From being 15 points down in Silver, I am now only 5 points down so again a very positive session for my Silver trade too. It is 10:00 pm UK time so the markets are closed at the time of writing this post for both Gold and Silver. I have a small loss on both trades at the moment but the trend being formed on the upside still supports a 'long' trade over a 'short' trade and the trend is still in tact. In hindsight I could have bought in slightly lower but too much waiting and analysis can sometimes make any decisions more difficult to actually enter the trade when a trend is forming nicely. I can see Gold pushing through $1250 on the new leg up and Silver trying to reach the $14.80 level. This is only assumptive analysis and the price action alone will prove any assumption correct or false.